Fire Hose Cabinet of 45 mm. diam., UNE-EN 671/2. Cofem make. Model P6420 with 20 meters of hose. Consisting of: Horizontal Cabinet, Reeling Frame, Hose, Globe Valve, Pressure Gauge, Hose Nozzle, Glass. Fire Hose Cabinet of 45 mm. diam., UNE-EN 671/2. Cofem make. Model MV5015 with 15 meters of hose. Consisting of: Vertical Cabinet, Hose, Globe Valve, Pressure Gauge, Hose Nozzle, Glass. Automatic sprinkler systems are widely regarded as the most effective method of controlling a fire. Sprinkler System extinguishes the fire by disc-harging water directly over the fire area in which the thermally sensitive sprinklers were operated. "It's an integrated system of underground and overhead piping designed in accordance with fire protection engineering standards. The installation includes one or more automatic water supplies. The portion of the sprinkler system above-ground is a network of specially sized or hydraulically designed piping installed in a building, structure, or area, generally overhead, and to which sprinklers are attached in a systematic pattern. The valve controlling each system riser is located in the system riser or its supply piping. Each sprinkler system riser includes a device for actuating an alarm when the system is in operation. The system is usually activated by heat f-rom a fire and disc-harges water over the fire area. Wet Pipe System. 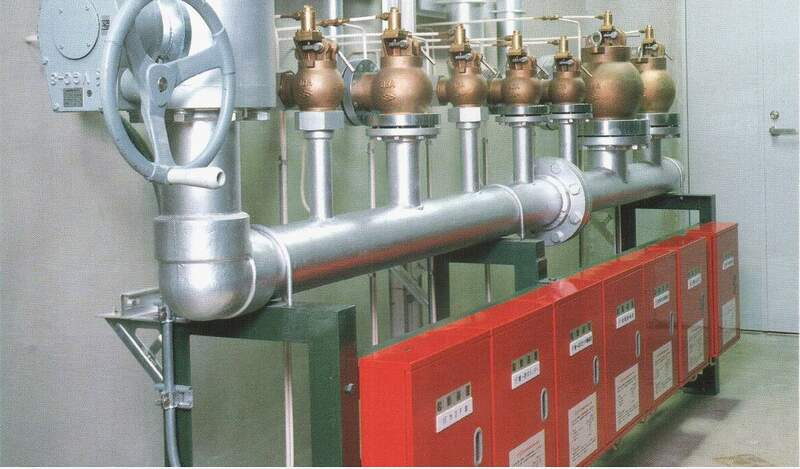 A sprinkler system employing automatic sprinklers attached to a piping system containing water and connected to a water supply so that water disc-harges immediately f-rom sprinklers opened by heat f-rom a fire. Dry Pipe System. A sprinkler system employing automatic sprinklers attached to a piping system containing air or nitrogen under pressure, the release of which (as f-rom the opening of a sprinkler) permits the water pressure to open a valve known as a dry pipe valve. The water then flows into the piping system and out the opened sprinklers. Preaction System. A sprinkler system employing automatic sprinklers attached to a piping system containing air that may or may not be under pressure, with a supplemental detection system installed in the same areas as the sprinklers. Actuation of the detection system opens a valve that permits water to flow into the sprinkler piping system and to be disc-harged f-rom any sprinklers that are open. Deluge System. A sprinkler system employing open sprinklers attached to a water supply through a valve that is opened by the operation of a detection system installed in the same areas as the sprinklers. When this valve opens, water flow into the piping system and disc-harges f-rom all sprinklers attached thereto. Combined Dry Pipe-Pre-action System A sprinkler system employing automatic sprinklers attached to a piping system containing air under pressure, with a supplemental detection system installed in the same areas as the sprinklers. Operation of the detection system actuates the tripping devices that open dry pipe valves simultaneously and without loss of air pressure in the system. Operation of the detection system also opens listed air exhaust valves at the end of feed main, which usually precedes the opening of sprinklers. The detection system also serves as an automatic fire alarm system..."
Certain high hazards cannot be controlled or extinguished with ordinary sprinkler systems, but with water spray systems (also say deluge systems). They are typical used in high hazard applications whe-re the need to disc-harge large quantities of water on the areas of fire. Applied as a solid stream to burning oil, water is not effective because it plunges below the oil surface and the oil floats on top of the water continuing to vaporize and burn. When broken up into coarse and fine sprays, water becomes our most economical and effective means of extinguishing fire in the medium and heavy oils. When it is broken up into fine, misty spray and when the entire surface of vaporizing liquid can be covered simultaneously, water spray is effective in extinguishing the flames above light oils such as kerosene and, under especially favorable conditions, even some of the lighter petroleum fractions. This is because water in spray form exerts its extinguishing effect at the oil surface before it sinks into the body of the oil. Ansul dry chemical piped fire suppression systems are designed to provide full-time fire protection in high-risk areas whe-re large, potentially disastrous fires could occur. They provide a means of detection and suppression for complex hazards which are too difficult and inaccessible for manual means of fire fighting; or for areas whe-re fires could be too large and hazardous for fire fighters to enter and fight. The Ansul IND-X Industrial Fire Suppression System is a pre-engineered, stored pressure dry chemical type with a fixed nozzle distribution network. It is listed with Underwriters Laboratories, Inc. (UL). The system is capable of automatic detection and actuation and/or remote manual actuation. Additional accessories are available for shutting down electrical power to equipment and shutting down the flow of gas lines. The fire suppression system has capabilities for total flooding, local application – tankside, and local application – over-head. Carbon dioxide is a clean, non-corrosive, non-flammable gas which extinguishes fire by diluting flammable mixtures of air and gas or vapor to proportions below their flammable or explosive limits. It is especially valuable whe-re other extinguishing mediums might damage stock or equipment. AnBao’s commitment to provide complete application solutions by utilizing the synergies between its products and services. Ansul, f-rom Tyco International Ltd. Company, USA. Simply stated, firefighting foam is a stable mass of small, air-filled bubbles with a lower density than oil, gasoline, or water. Foam is made up of three ingredients…water, a foam concentrate, and air. Water is mixed with a foam concentrate (proportioned) to form a foam solution. This solution is then mixed with air (aspirated) to produce a foam which readily flows over fuel surfaces. separating the fuel f-rom the air (oxygen). fuel surface. The fuel is cooled by the water content of the foam.